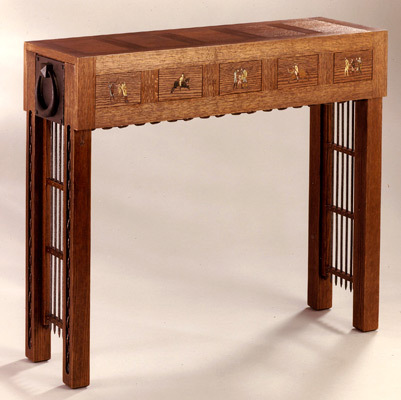 This table is inspired by medieval imagery, in particular the castle portcullis or front gate. Selected scenes from the French Bayeux Tapestry are hand painted with acrylics on small oak panels on the front and back and each scene is different. At each end of the table there is a hand cut dovetail drawer. The table top has small square inlayed pieces of oak with black borders to mimic the panels on the sides.